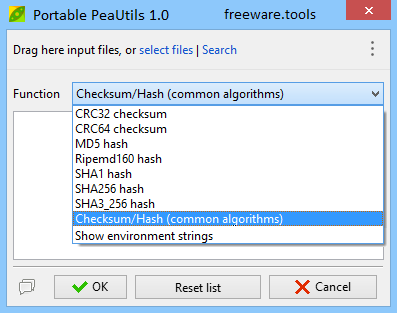 Portable PeaUtils is a suite of file management tools, from the authors of PeaZip that allows for secure deletion, hashing, file splitting/joining and more. The goal with this utility was to group various file management tools in a very simple GUI that will be easy-to-use for anyone. All the management options are contained within a drop down which includes byte to byte comparisons, secure deletion of free space/files, split/merge spanned volumes, hex previews for files, calculate file checksum/hash, including CRC32, CRC64, MD5, SHA1, SHA256, SHA-3_256, and more. Given this is a portable tool, no installation is required to use it. Portable PeaUtils covers a part of the file management functions you might need at some point, comprising options to calculate hashes of various types, splitting and merging files, securely deleting documents that contain sensitive information, and more. All the functions of Portable PeaUtils are available via a drop-down menu and, from there, the results are displayed in separate windows. While it might not be the most fortunate approach, it's obvious that it makes the application intuitive and easy to use, and all its functions quite accessible. Designed as a suite of file handling tools, Portable PeaUtils features a variety of functions. To begin with, you can use it to calculate different checksums in batch mode, which means multiple files can be processed at once. CRC32 and CRC64, MD5, Ripemd160, SHA1, SHA256, and SHA3-256 are the supported hashes. And if you are not focused on a single hash type, you can have Portable PeaUtils calculate common algorithms only, or all the algorithms for all the input files. Another function of Portable PeaUtils enables it to analyze files or folders to determine their size, the date of the last modification, additional attributes, and the directory content. It also reveals the potential compression rate, allowing you to save all this data in a TXT or a CSV report. If you have files on your computer that are too large, you can split them using Portable PeaUtils. Alternatively, the application makes it possible for you to join spanned files. Moving further, Portable PeaUtils also features a byte-to-byte comparison utility, which enables you to view differences between two files. Also, sensitive information can be permanently deleted using the dedicated function of Portable PeaUtils. Portable PeaUtils bundles a set of tools that might come in handy to anyone.